With a sometimes uneasy mix of parody and patriotism, this wartime dramedy from Lone Scherfig (An Education, The Riot Club) concerns itself with the making of a WWII propaganda film. Their Finest sports a high-calibre cast and a knowingness which sometimes distinguishes it from its heritage film peers. Yet, in its eagerness to please, it often plays things stiflingly safe. Set in London, 1940, it follows fledgling screenwriter Catrin Cole (a reliably lovely Gemma Arterton) as she joins the Ministry of Information's Film Division. Thinking she's scored a secretarial position, Catrin is accidentally hoisted up the career ladder in the absence of male rivals but her sensitivity, imagination and instincts help her thrive. Working alongside more experienced scribe Tom (Sam Claflin) they come up with a story to inspire a nation, one that's later hijacked to persuade America to join the war effort. The Danish director Scherfig, once associated with that country's radical Dogme 95 movement, has made something thoroughly, perhaps even a little blandly, British. Wrapped in the cosy cloak of nostalgia, events are insulated from the wartime action in a way that creates distance from danger and that dulls moments of high anxiety. As it reflects on the often unenviable lot of a writer, the film's satire too is muffled and its mild-mannered lead represents a brand of female advancement that seems constructed to ensure no-one is made to feel ill at ease. Still, Arterton carries it along with her charisma and her subtle emoting elevates a film that too often plumps for the obvious. Bill Nighy, in particular, may give his most 'Bill Nighy' performance yet. While anonymous work from Claflin and Jack Huston as Catrin's artist lover means Arterton is saddled with not one but two unworthy romantic interests. There are a few nice touches – including Catrin rewriting a scene from her own life so that it plays out more satisfactorily – and it's less wedded to the prospect of a happy ending than you'd expect. 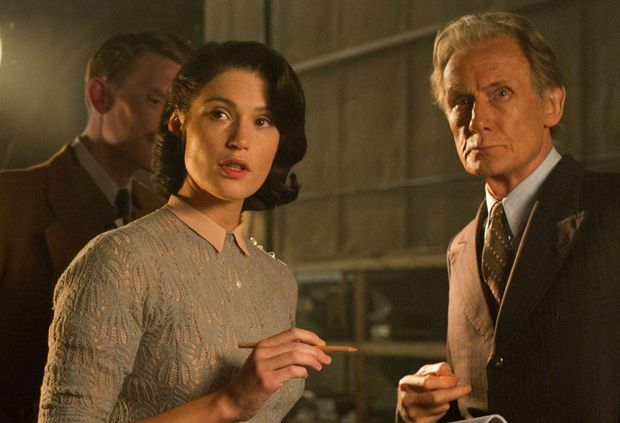 Although Their Finest can't quite make the farce of the film shoot fly, it does have some comedic charm, ambling along in rarely less than likable fashion toward its destiny as a Sunday afternoon comfort-watch. And, with an ensemble filled out by Eddie Marsan, Helen McCrory and Jeremy Irons, it's suitably starry. It's just a shame that a movie whose title alludes to greatness is actually fairly run-of-the-mill. Screening on Sun 19 and Mon 20 Feb as part of the Glasgow Film Festival 2017. General release from Fri 21 Apr. London, 1940: fledgling screenwriter Catrin Cole (Arterton) joins the Ministry of Information’s Film Division and starts working on a propaganda movie. Scherfig wraps the war in a cosy cloak of nostalgia in a way that dulls moments of high anxiety, and despite a fine ensemble it’s all too muffled and mild-mannered.